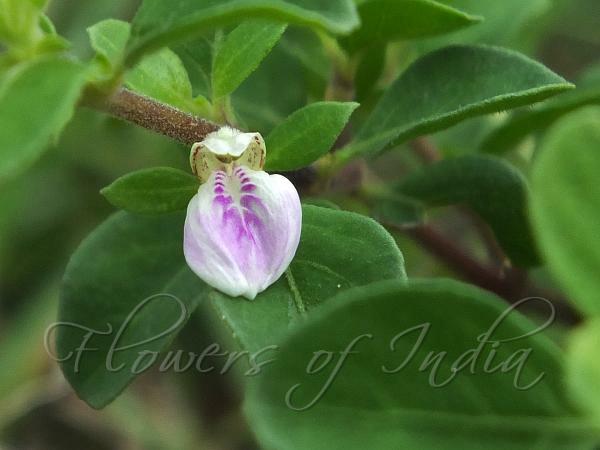 Tarangambadi Justicia is a subshrub which is named after Tarangambadi, formerly Tranquebar, a town in the Nagapattinam district of Tamil Nadu. Leaves are 2.5-3 x 2 cm, obovate-round, tip blunt, base wedge-shaped, membranous, velvet-hairy; leaf-stalk 1.5 cm. Flowers are born in spikes at branch-ends and in leaf-axils, up to 10 cm long. Bracts are 1 x 0.7 cm, broadly ovate. Calyx teeth are 5 mm, lanceshaped, 3-nerved. Flower are two-lipped, tube 5 mm, hairy inside, upper lobe 7 x 5 mm, lower narrow, white with pink blotches; filaments dilated, 2 mm; ovary 1.5 mm, fringed with hairs along the margins, style fringed with hairs. Capsule 8 mm, widened above the middle, puberulus. 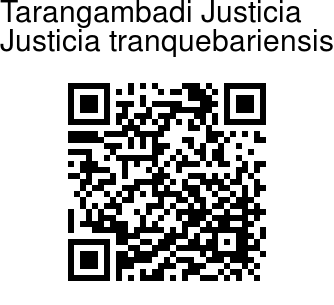 Tarangambadi Justicia is found in Peninsular India and Sri Lanka. Identification credit: Siddarth Machado Photographed in Satyamangalam Tiger Reserve, Tamil Nadu.